Newspaper ad for MOROCCO (1930), Note the subtitles in the image. Japanese is written vertically. One of the problems unique to Japanese cinema industry in early 1930s was demise of Benshis, interpreter/lecturer/storyteller of movies. During the silent film era, a Benshi was an essential part of movie experience. He stood right next to the screen and provided live speech to audience, explaining and coloring up the events up on the screen. He gave the background of the story, imitated conversation between characters, or supplemented anecdotes of the film. Popularity of a Benshi was an important ingredient for movie business, sometimes making a substantial difference in box office especially for competitive urban markets. Now, advent of talkies was the most serious threat ever to those Benshis. Their very existence depended on the fact that movies didn’t talk. They demanded the rest of the industry to preserve and cherish their art form against this cheap uninteresting technology. Theater owners, distributions and production companies were cautious about how they should proceed with the transition, since labor disputes involving Benshis were making headlines. In reality, as the conversion to talkies in Japan was very slow process anyway, Benshis didn’t lose their jobs overnight. But there was one area in which talkie transition was so quick, complete and total: Hollywood movies. There, the presence of a Benshi was more than embarrassing. During the silent days, the Japanese distributors didn’t replace Foreign-language intertitles with Japanese ones, so Benshis provided translation and narrative coherence to Hollywood and European films. Since spoken words anticipated more quantity in information, foreign-language talkies needed some form of simultaneous translation during their screening. Naturally, Benshis were expected to provide them, but their overlapping voice over the movie sound was distracting, confusing and more than annoying. Ironically, foreign-language talkies required some form of ‘silent’ simultaneous translation. 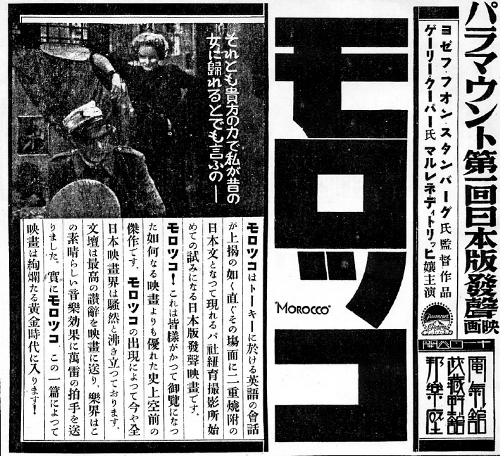 The first successful Hollywood talkie in Japan was Josef von Sternberg’s MOROCCO (1930). In fact, in many textbooks, it is cited as the first talkie screened in Japan, which is not true (It was Fox Movietone shorts). The reason for the success was the use of ‘super-imposed’ subtitles burned on its prints. This is the same standard subtitles for foreign language films as we know today. Simple, yet most effective, it would become the industry’s standard. Paramount asked a Japanese technician to visit its Hollywood studio so that he could work on the Japanese translation while the film was still under production. The success of MOROCCO stimulated theater owners and distributors to attempt various uses of subtitles. Some theaters tried a separate small screen to provide translated Japanese texts, and others inserted Japanese intertitles (just like the ones in silent films), usually at the beginning of a reel to summarize the story. There were some Japanese versions with Japanese actors standing in for the Hollywood original, just like the Spanish version of DRACULA. They all worked fine to some extent, but not a perfect solution. the separate screens had issues of synchronization, the inserted Japanese intertitles were too coarse for complex plots and Japanese version were too costly. Some theaters still preferred the Benshis’s narrations despite of subtitles, while others laid them off. In the end, there was no need to have a Benshi to narrate the story for foreign films, as ‘super-imposed’ subtitles became the norm. Eventually, as Japanese domestic productions were converted to talkies as well, talented Benshis sought after various jobs in various segments of entertainment industries, ranging from voice-over narrations to radio personalities. Musei Tokugawa, the most popular Benshi during late 1920s was, indeed, busier than ever. As a narrator, a movie actor, a radio personality or a gag man, his talent for spontaneous narration and conversation was valued. But, only few had such an opportunity. Akira Kurosawa ‘s elder brother was a Benshi, fought as a labor union leader, but lost his job in the end. He committed suicide in 1933.